Designers and contractors throughout the country have chosen Low-Iron Ultra Clear Glass because it has the highest transparency in the industry. With its stunning clarity, Low-Iron Ultra Clear Glass has been used on such iconic buildings as the Comcast Center in Philadelphia and the Alcoa Building in Pittsburgh. Now, imagine what it can add to your home. Low-Iron Ultra Clear Glass contains less than 10% of the iron found in regular glass. This allows Low-Iron Ultra Clear Glass to transmit 91% of light, compared to regular glass, which can only transmit 83%. Also, we’ve all seen the green tint that regular glass produces, which becomes more prevalent with thicker glass. Low-Iron Ultra Clear Glass eliminates that green tint, providing impeccably clear views by allowing whites, reds, and yellows to pass through at a higher percentage. That way, the beautiful ceramic tiles, accents, and furnishings you’ve chosen as part of your bathroom renovation, will pop even more. Tiles, accents, and furnishings pop even more! Low-Iron Ultra Clear Glass has many uses! Check out our Photo Gallery to see a collection of projects. Whether it’s a PPG Low-Iron Ultra Clear Glass shower door and panels or a variety of other architectural uses, this custom glass will quickly become the focus of your home décor. Visit our Photo Gallery or our Showroom to see the clarity Low-Iron Ultra Clear Glass can add to your project. Request a quote or call us today at 732-303-9044 to schedule an appointment. 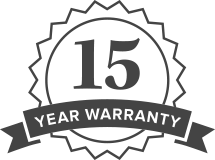 Our 15-year warranty on all frameless glass door products is unmatched by any of our competitors. Come to ShowerMan and see why our service is the best around.